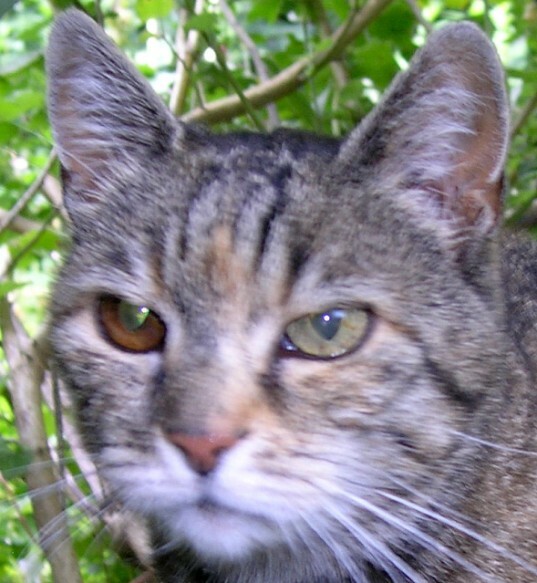 Wild cats in temperate regions generally have hazel eyes, but domestic cats' eye colours vary from blue, through green to yellow, orange and brown. Within each of those colours there is wide variation in hue and intensity. The colours are not discrete, but form a continuum, for example between blue and green there are "sea-green" and aqua while between green and yellow there are lemon and lime shades. The coloured part of the eye is called the iris, a word that means "rainbow". Some eye colours are linked to coat colour, for example colourpoint (Siamese pattern) cats have blue eyes. 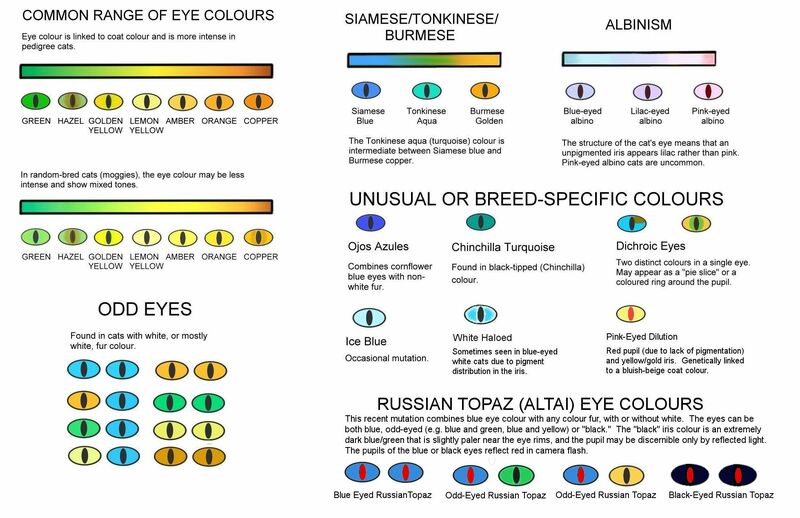 In most breeds, various eye colours were possible so breeders set chose the eye colour that harmonised with the coat colour and wrote that into the breed standard. While breeders might prefer certain pedigree black cats to have vivid orange eyes, in the general cat population black cats can also have green or yellow eyes. There are two major factors that influence feline eye colour: iris pigmentation and blue refraction. The iris has 2 layers containing pigment-producing cells (melanocytes). The outer layer is the stroma, consisiting of consists of loosely arranged cells. Underneath the stroma is the epithelium which contains tightly packed cells. Both the stroma and epithelium produce pigment, but in different amounts. The pigmentation of the iris is caused by melanin and the colour ranges from lemon yellow to hazel to deep orange or brown. In addition to this, the "transparent" structures of cats' eyes absorb and refract light much like a sheet of glass. Viewed head on, glass appears colourless but viewed edge-on it is greenish or bluish. The size, spacing and density of the fibres in the stroma determines how it reflects and refracts the light, determining the shade of blue. Just like glass, the transparent structures in cats' eyes are transparent blue, ranging from practically colourless to deeper blues and violet-hued blues. The combination of the blue refraction and iris pigment produces the overall eye colour. Looking into a cat’s eye is like looking through a blue-tinted window; the blue tint affects how we see the other pigments present in the iris. The iris pigmentation and the transparent structure pigmentation are both controlled by multiple genes in different places on the chromosomes (polygenes). Littermates can inherit different mixes of these genes from the same parents and have different eye colours. Different mixes of polygenes causes the continuum of shades. The type of colour and the intensity depends on the number of melanocytes in the eye and how active they are. If there are no melanocytes, the eye appears blue (or in rare cases, pink which is due to the colour of the blood vessels). A low number of melanocytes gives green. A high number of melanocytes gives orange. A second factor is how much pigment those melonocytes produce (activity). Those that produce less pigment give a lighter shade, while those that are more active and produce a lot of pigment give the deeper shades. There is no single inactive/active switch, so there are varying shades inbetween. Eyes with a low numbers of melanocytes (green) can range from pale green (less active melanocytes) to strong green (industrious melanocytes). Similarly, the yellows range from light amber to deep copper. The activity levels of melanocytes is genetically determined so it is possible to selectively breed for either deeper or paler eye colours. The way that light passes through the various blue-tinted structures gives us the final visible colour. Kittens are born with blue eyes. The adult eye colour develops around 6-7 weeks old, but may not reach its adult hue until 3-4 months old. During a cats' lifetime, illness and injury can cause variations in eye colour, but there is no truth in the old wives' tale that feeding a cat on fish will cause its eyes to change colour! That tale is due to old wives weaning kittens (probably onto boiled fish in the days before commercial cat foods) around the time the eye colour naturally changed. There is also some pigmentation on the inside of the eye and a highly reflective area behind the retina called the Tapetum Lucidum. This is an iridescent layer of tissue that reflects light back through the eye. and helps cats see in low light - it also causes eye shine in flash photos. Most blue-eyed white cats lack the Tapetum Lucidum; their eyes reflect a dull red colour (caused by the blood vessels) rather than an iridescent eye-shine. Kittens are born with blue eyes and this is not a guide to their adult eye colour! In a few breeds, the blue colour is permanent, but in most it will be replaced by another colour starting around 6 weeks old. The blue colour depends on the intensity of blue refraction. Blue eyes are a feature of colourpointed cats where the colour is linked to the temperature-dependent albinism that produces the colourpoint pattern. The blue colour varies in hue and intensity and breeders must selectively breed cats with the best eye colour to try to pass on that colour to the kittens. Blue eyes also occur in white cats and are associated with the epistatic white (often called dominant white) gene which is quite different from albinism because it masks an underlying coat colour. The white spotting gene also affects eye pigment if there are white patches around the eyes. White cats can have one or both eyes blue. The non-blue eye will be whatever colour the breed standard requires for example in white Persians, the other eye is vivid orange. 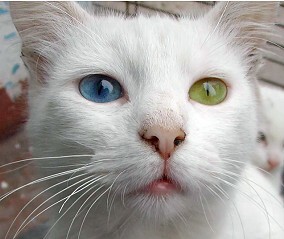 In the randombred odd-eye white cats, the non-white eye might be green or yellow or even a different shade of blue. For more on blue-eyed white cats White Cats, Eye Colours and Deafness. The Ojos Azules is characterised by cornflower blue eyes, but the mutation is linked to lethal deformities if a kitten inherits 2 copies of the mutated gene. In this breed, the eye colour is independent of the coat colour. Other blue eye mutations that are independent of coat colour crop up from time to time. To date, most have been a pale blue rather than an intense blue and none of these other mutations have been deliberately bred. A grey bicolour (tuxedo pattern) cat with intense sapphire blue eyes was found on a country road in Windellama, New South Wales, Australia by A M Schnieder. Since the Ojos Azules has not been imported into Australia, this represents a spontaneous mutation among the feral population. Whether it is the same as the American Ojos Azules mutation is not known. Green ranges from a yellowish-green through gooseberry-green to deeper greens and blue-toned greens. Some of the older standards spoke of grass-green eyes, indicating the green be as rich as possible. Green tints and flecks also appear in some hazel brown eyes. The Chinchilla Longhair (Chinchilla Persian) and its shorthaired equivalents are notable for their black-rimmed sea-green eyes. Aqua (blue-green) is found in the Tonkinese which is intermediate in type and colour/pattern between Siamese and Burmese cats. The Siamese has blue eyes while the Burmese has orange eyes. Yellow varies from a pale lemon to more vivid hues. There is overlap between the yellows and browns (pale hazel or tan) and also between yellows and greens. While the boundary between yellow and green may be fuzzy, there is no mistaking an orange-eyed cat. The colour is often described as coppery. Many of the breeds developed by early cat fanciers in the UK called for orange eyes as the pale greens and yellows were considered undistinguished, while bright orange complemented the coat colour. Brown covers a wide range from hazel (the normal colour of temperate climate white cats) through to darker browns. Some browns appear tinted or flecked with green, orange or yellow. The scientific term for odd eyes is heterochromia iridium (different coloured irides). It can be genetic (inherited), congenital (development defect) or acquired (illness, injury, medication). In the cat fancy, odd-eyes means having one blue and one other-colour eye. 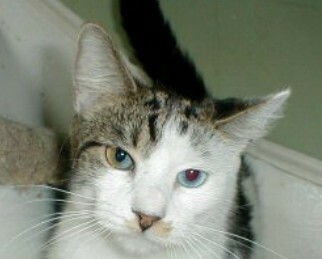 Odd eyes are most common in epistatic white cats where one eye is blue and the other is orange, yellow, brown or green. Pedigree odd-eyed white cats have one blue and one orange/amber eye, but in randombreds the non-blue eye may be yellow, green or brown. Another form of odd eyes is found in white cats where one eye has a tapetum lucidum (green eye shine in the dark) and one eye lacks the tapetum (red eye shine). These different eye shines are seen in reflected headlights or flash photography. Bicolour cats with a high degree of white on the face may also have odd eyes. Heterochromía from birth is common in cats (blue/amber), horses (blue/brown) and some breeds of dog (blue/brown). It is uncommon in humans. 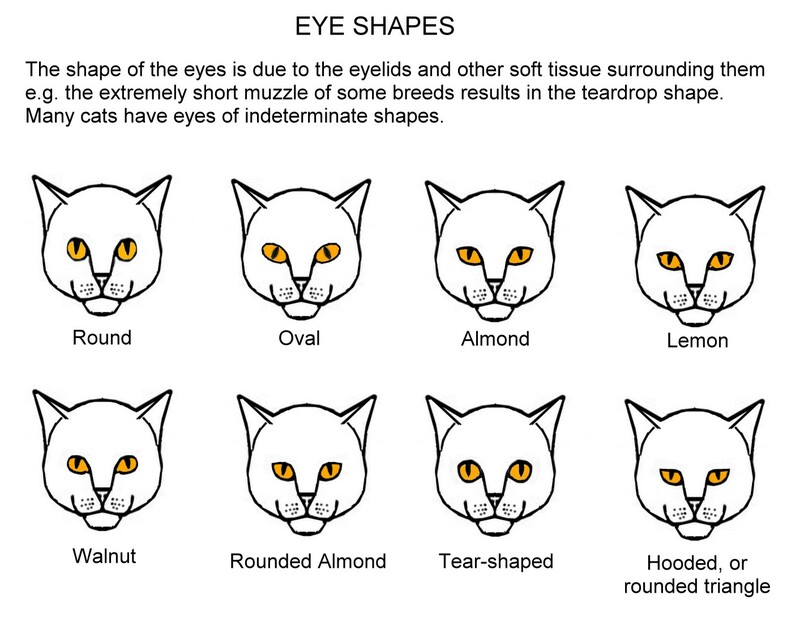 In cats, there is no specific gene for "odd eyes," but it is associated with the white spotting gene and the white masking gene (epistatic white/dominant white). These genes prevent pigment production in the embryonic stage, which includes the pigment of the iris. If some melanocytes (pigment cells) remain active in the eye area, this is sufficient to make the eye green, amber, brown or yellow etc. Depending on the activity level of the melanocytes, the eye colour ranges from blue with other tints through to fully coloured, and from pale through to intense colour. During the cat's lifetime, the effect may be incremental so that the intensity of eye colour deepens, gradually replacing the blue colour. Heterochromia is mostly found in cats with white coats or white patches. Occasionally it is seen in coloured cats. When present from birth, it can be a result of congenital abnormality (birth defect), mosaicism (merged embryos), or a somatic mutation in some cells that form the skin and eye (birthmark). These are not hereditary and this form of heterochromia is not passed from parent to offspring. Odd-eyed white cat photographed by Rodrigo Arancibia in Iquique, Chile. She shows no sign of deafness. her kittens are solid white, indicating the dominant white gene. Occasionally the different colour eyes are due to an eye injury or illness that has damaged the iris or one eye. In this case the trait cannot be passed on. Partial heterochromia (dichroic eyes) occurs when different amounts of melanocytes, or melanocytes with different activity levels, are present in distinct areas of one iris. This gives the “pie slice” or “coloured halo” effects. Dichroic/dichromatic eyes have two colours in one iris. For example there may be a yellow ring around a green iris. This is considered a fault in show cats, but can be very attractive. Less commonly, there may be a distinct differently coloured section (like a slice of a pie) in the iris, for example a brown area in a blue or green eye. This has been reported in some white cats. Instead of affecting the pigmentation of the whole iris, the white gene affects only part of the iris. One or both eyes can be affected; if both are affected there may be a mirror image effect. These are sometimes called "weird-eyed" cats because they are not odd-eyed in the normal sense. The photo is "Gilbert" who has one blue eye and one dichoric eye. Albinism is found in the Siamese to closely related Oriental breeds due to inbreeding. 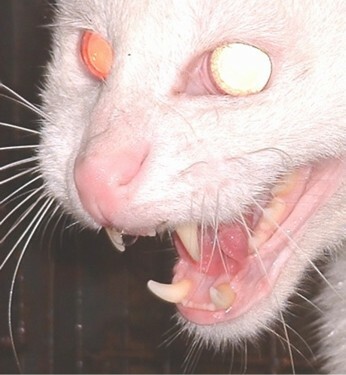 Greer Stothers (2013) provided photos of an albino Oriental Longhair, Pangur. Pangur's eyes look like faded lilac-blue. On close inspection, the pupil is a dull red, while what looks like lilac is just the pale blue refraction of the lens overlaid on a pinkish pupil. This makes Pangur very photo-sensitive. Pangur's parents are half-siblings with the same father. Pink is not a normal eye colour in cats. It is found in pink-eyed albinos and is due to complete lack of pigment in the eye combined with very little blue refraction. True albinos entirely lack melanin and the iris is pale pinkish-white. Because of blue refraction, the eyes usually have a bluish hue, result in a blue-eyed albino (as with Pangur above). Very rarely the transparent structures are colourless and a pink-eyed albino results. It was once believed impossible for a cat to have pink eyes due to the structure of the eye and true albinos had pale blue eyes, but there have now been several pink-eyed albinos reported in recent years. Albinism has been recorded in the Bengal breed and in its wild parent, the Asian Leopard Cat (shown here). 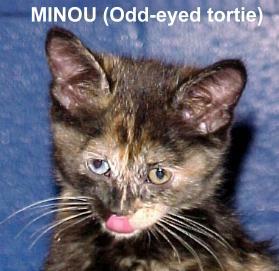 Pink-eyed dilution has been reported once in the cat (Todd NB. 1961. "A pink-eyed dilution in the cat" Journal of Heredity 52, pg 202). The type of dilution found in cats is blue dilution which turns black into grey. A second type of dilution seen in some mammals is "pink-eyed dilution" which gives a bluish-tan/fawn coat and also depigments the eye, giving a pink or ruby appearance. This has been reliably reported only once in cats when a pink-eyed female with a light tan coat was produced (none of her kittens survived so pink-eyed dilution in cats seems to have been lost). Pale irises and underpigmented retinas also occur as part of Chediak-Higashi syndrome along with a pale coloured coat (seen in Blue Smoke Persians) . In addition to the different colours, there are several distinct eye shapes. These are shown in slightly exaggerated form in the chart below.